She wears a leather cuirass, green felt linens and a pair of leather boots. She is armed with an iron dagger and an iron bow with 7 iron arrows. 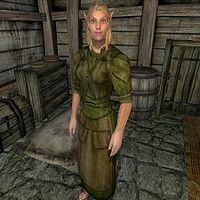 She also carries a spare stitched green shirt, the key to Methredhel's house, and a small amount of gold.